When I lived in New Haven, Connecticut, my favorite time of year was early summer (and this is not only because winter was long gone). Every June, New Haven hosts the International Festival of Arts and Ideas. The Festival of Arts and Ideas is a two-week event bringing world class performances to the small city: dance, theater, concerts, art installations, circus acts and lectures on current events. Best of all, most of the events were free. To top it all off, New Haven’s hipster and counter-culture scene put on their own festival, Ideat Village, featuring local music, burlesque shows and the weirder aspects of the Elm City. On those June days, I would stop by my favorite coffeeshop, grab an ice coffee and bagel, and walk the transformed streets. I haven’t seen anything like it since … until last month when I visited the annual Hi Seoul Festival in South Korea’s capital city. The Hi Seoul Festival is held in the spring and fall of every year. It’s a cultural event bringing together hundreds of artists in many different stripes for (mostly free) performances throughout the city. For the 2011 May Hi Seoul Festival, there was modern dance, puppetry, miming, theater, music from around the world, art installations and some very strange performance art. Mimes in Korea? Who would’ve thought?! But there was Ko Jae Kyung, perhaps the best known mimist in Korea, performing a free show. Pretty women, bouncy balls, a midget: I’m no fan of modern dance, but this performance by USD Modern Dance company held my interest. A headless old man, killer fish, skeletons — you have to check out this performance by Theatre Nomad. Our mission: To not leave South Korea before giving Andong one more chance. Regular readers of the blog will remember our last trip to Andong in October for the International Mask Festival. The festival was great, but the whole experience was overshadowed by the first (and only) time we felt ripped off in Korea. This time, however, we wanted to go to the Hahoe Village outside of town. So we left Daegu on a bus bound for Andong, arrived at the city’s new bus terminal and hopped on another bus to take us the several miles to Hahoe Village, a 600-year-old traditional neighborhood on the banks of the Nakdong River. Traditional villages are big attractions in places like Andong, which is a fairly bland Korean city. The Hahoe Village is on the UNESCO World Heritage List and one of the most famous historic villages in the country. It was even visited by Queen Elizabeth in 1999 — something the community is very proud of. They even built a little museum with pictures from that special day. The village is a nice collection of tile- and thatched-roofed homes called “hanok.” The Nakdong River offers a nice view. A nearby cliff is also photogenic, especially when viewed from the small pine tree forest nearby. But this is definitely no Cracker Country tourist trap with docents and wooden cut-outs to take pictures with. It’s a real community — people actually live in these houses — and offers all the trappings of a normal Korean neighborhood: There is trash along some of the walkways and when we visited, it must have been garbage burning day. The real attraction for us was the collection of phallic sculptures that greet your entry into the village. Not necessarily weird, unless you consider the normally conservative nature of this country. After some nice photo opps and a little shopping in the traditional tourist trap area outside of the village, we left to find Andong’s other main attraction: the longest footbridge in Korea. I was excited. I like bridges. I like water. I like things that break records. And if this bridge has a few boards missing to make it rustic and thrilling — all the better to write home about. So we took another bus to Andong’s more populated center (1,200 won) and began walking toward the city’s other river. The wind whipped through our jackets and I once again cursed my decision to not bring my scarf. A 45-minute walk later, we arrived at the bridge. Now, I don’t know Korea’s history with bridges or if something was lost in translation, but if Andong’s bridge is the longest in Korea, I think there’s a good chance it is also the only footbridge in Korea. It took about three or four minutes to cross — and that’s including posing for pictures. 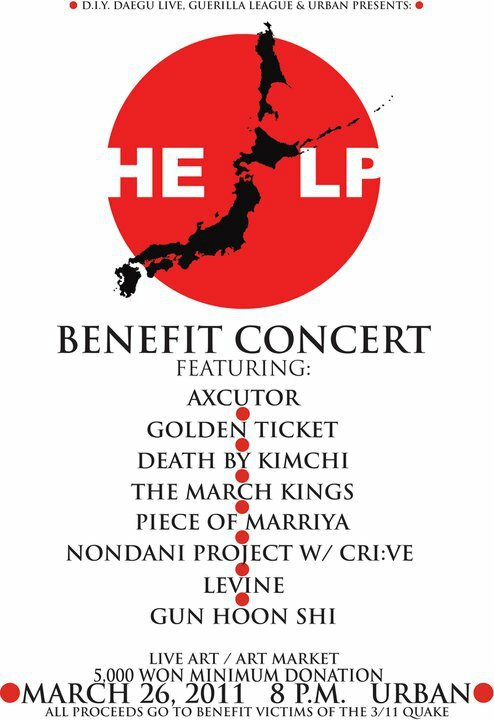 After a stroll through a fake folk village, we decided to head back to Daegu to attend a Japan earthquake benefit concert. But we had one more activity on our list. If there’s one thing our Korean friends have told us about Andong, it’s : “Try the Andong jjimdak!” This kind-of stew with chunks of steamed chicken and vegetables in a spicy, soy-based sauce is the city’s culinary speciality. I’ve had Andong jjimdak in Daegu and I was doubtful my inexperienced Korean palate could taste the difference in the dish’s city of origin. After some searching, we found a jjimdak restaurant direclty across from the footbridge entrance. We walked in, took off our shoes and sat down at a table. We ordered our jjimdak (22,000 won) and some sides of rice. In about 15 minutes, our server brought us a huge, tire-sized dish of Andong jjimdak. And, truth be told, Andong jjimdak really is better in Andong. If you go: From Daegu, catch the Andong bus (7,700 won) from a bus station near Dongdaegu Station. The bus station will be across the street and behind the first bus station you see. The ride to Andong takes 90 minutes. Once there, walk out of the bus terminal to the main road and catch city bus No. 46 for the 30-minute ride to Hahoe Village. 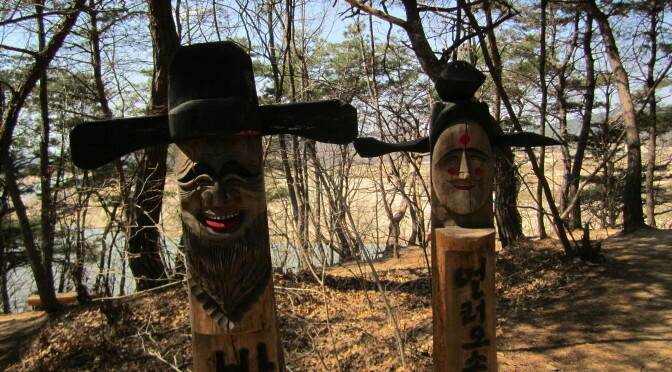 The village costs 2,000 won to enter.